Here's my 3rd card as the July Guest Designer over at the Christmas Card Challenges Blog. The challenge this week is to use the Emboss Resist Technique. I used the Hero Arts background stamp called Stunning Snowflakes. I embossed the background stamp in white and then mixed several colors of Tim Holtz Distress Stains to make the blue color. The snowmen stamps and sentiment are from a Paper Smooches set called Swanky Snowdudes. 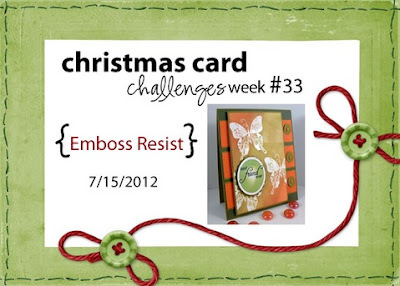 Why not try some emboss resist and get a head start on your Christmas cards. Thanks for stopping by! Hey Donna, I like to write my comments based on my first reaction when I first see the project and this just made me really smile!!!! SO cute!!! Love EVERYTHING about it, FAB card my friend! Such a fun Christmas card, Donna! Those guys look happy that it's snowing! Super cute Donna! I adore these little snowmen (one of my fave sets) and the bg you created is just awesome! This is just adorable! I love that resist background!! such cute snowmen, haven't tried this technique but gives a great look for Xmas cards. I love this Donna. I love the resist background and your perfect fussy cutting. I can never get that tiny white border around an image...grrr! lol Great design!